I don’t think anyone expected to see another Marvel Ultimate Alliance game. Even with the coming Avengers film, its existence seemed unlikely; there would be a Marvel game, just not this one. So it was super shocking to learn that not only is Ultimate Alliance 3 a thing, it’s also going to be a Switch exclusive! Nintendo revealed Marvel Ultimate Alliance 3: The Black Order via a trailer (shown below) during the Game Awards. Being developed by KOEI Tecmo Games/Team Ninja, the trailer provides a brief look at the game’s explosive action. It shows multiple heroes and villains fighting over the Infinity Gems. Though it features Thanos and his Black Order, the game’s story will be unique; it won’t follow the events from the previous or upcoming Avengers film. Up to four players can team up in hopes of taking these foes down using characters like Captain America, Wolverine, Spider-Man, and the various Guardians of the Galaxy. 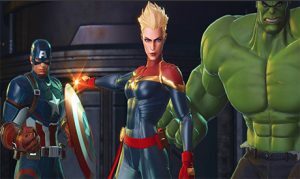 Marvel Ultimate Alliance 3: The Black Order will launch on the Switch sometime next year. Feel free to check back as we continue to follow this title! Team up to battle Thanos and his Black Order this July!